Did you know that farmers can get paid up to $10K per year per wind turbine installed on their farm? I was browsing for photos on flickr and came across this photo, with the following comments. Farmers get $10k, per turbine, per year. Nice, huh? But you have to have enough open space, or your land won’t qualify. Obviously, it’s all about gathering enough wind to justify the cost. It’s good to see this kind of things happening. Renewable energy sources such as those from wind turbines should be encouraged and it’s a win-win situtation for farmers to get paid for having their land installed with wind turbines while allowing private/government owned electricity providers to get more power into their grid. I heard that Germany’s government is giving out allowance for every household to install solar panels and buying back unused power. I wonder if tall city buildings will get their own green gardens with mini wind turbine one day as envisioned in this microsoft sustainability video. Perth (where I’m currently residing) is said to have the strongest wind and I have seen wind turbines installed at Albany (where there’s seriously strong wind), Rottnest Island and somewhere up North. I’m not sure how much power they can generate but think there’s more that can be done across the country in renewable energy since there’s large piece of vacant desert land in the middle of Australia and that it’s one of the leading country in terms of solar power research and gets lots of sunshine all year long. Although ironically, Australia is also currently too busy digging up coal, iron, fossil fuels plus uranium as that’s where the big money lies. 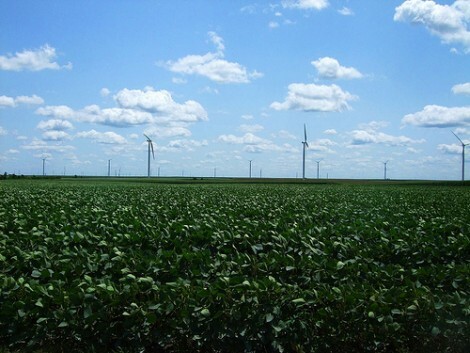 I saw your article on farmers making money with wind turbines…I live on a 40+ acre farm in Iowa and would welcome any one who wants to pay me money to put up a wind farm…how do I find out who to contact??? I would liket to know who to contact for a wind farm. I live on a 40+ acre farm and would welcome anyone who would pay me money to install a wind farm. How do I find out who to contact??? recieved the article about farmers making as much as $10,000 a year to have wind turbines on their land…does anyone know who I contact to see if my farm would quailify? It is generally windy here, we have plenty of open space. I too would be interested in talking to someone about having a wind turbine installed. I seen the article about getting paid for having wind turbines installed please contact me to let me know if this is possible.